1. Place the blueberries (reserving a few for garnish) and manuka honey into a small saucepan and heat over a low heat until the fruit softens slightly. Remove from the heat and leave to cool slightly. 2. 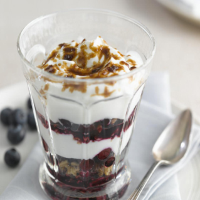 Spoon the granola into 4 small serving glasses, top with half the blueberry mix, followed by half the yogurt. Add another layer of blueberries and a further layer of yogurt. Top with the reserved blueberries and scatter the brown sugar over the top of each dessert. 3. Place in the fridge for 10-15 minutes to allow the sugar to melt into the yogurt and turn syrupy. This pudding also makes for a brilliant portable breakfast. If you have an early start, make it in the evening and take it to work the next day. Try varying the fruit – all berries work well, as does grated apple with a pinch of ground cinnamon.